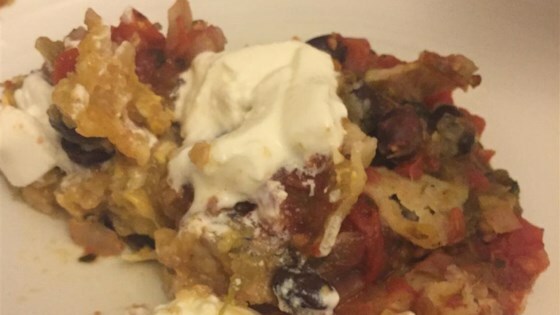 "A unique twist on traditional nachos! Very, very yummy and very, very easy to make! I used Trader Joe's® Cuban-style black beans for the beans." Spread 1/2 the tortilla chips into a 10 1/2x6-inch baking dish; sprinkle with 1/2 the Mexican cheese blend. Layer 1/2 the black beans over cheese layer. Repeat layering with remaining tortilla chips, Mexican cheese blend, and black beans. Spread onion over bean layer; top with salsa verde and salsa casera. Bake in the preheated oven until cheese is melted, about 20 minutes. Top nachos with sour cream; serve with lime wedges.